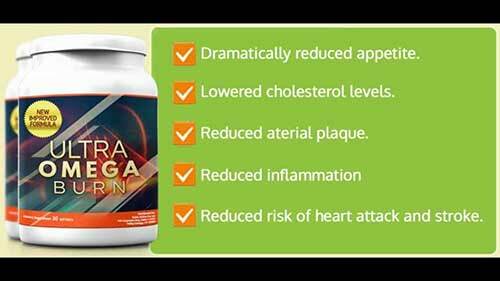 Ultra Omega Burn is a weight loss supplement that is alleged to be so powerful it will cause your fat cells to “open up” and release all the fat locked inside and force the body to use it for energy. The key ingredient is a form of Omega 7 fatty acid (palmitoleic acid) that is naturally occurring in dairy products such as milk and cheese. The compound is claimed to have the power to regulate blood sugar levels and prevent overeating. Palmitoleic acid is also supposed to be good for lowering cholesterol levels and ensuring a healthy cardiovascular system. In fact, the Ultra Omega Burn says this single ingredient is capable of doing so many things it appears to be being marketed as a magical cure all. Admittedly, some preliminary research suggest palmitoleic acid has certain abilities that warrant further investigation, but it should only be seen as an ingredient that has promise. It’s far from being the fat incinerator the Ultra Omega Burn website says it is and there is no real proof it will work. Ultra Omega Burn is marketed by Nutra Active Pte Ltd and a listing on Bloomberg states the company is based in Singapore. We have no reason to dispute the validity of the company involved for manufacture. Ultra Omega Burn contains an unspecified amount of palmitoleic acid, locked inside a gel-type capsule. It’s unclear if any other ingredients are involved, but the way the product is marketed suggests there are not. Usage Guidelines – One capsule is required each day and customers are told diet and exercise is not needed. The product is alleged to be the result of a Harvard study that has been repressed and “buried under piles of lies” and, according to a rather long winded marketing video, the reason you have not heard about the “secret” ingredient on the news is diet pill manufacturers want you to go on buying diet pills that don’t work. We searched the Harvard University website and found an article about a study that suggests palmitoleic acid may reduce the risk of Type 2 diabetes. The study did not explore the value of palmitoleic acid as a weight loss aid. Looking in other areas, we found details of a study conducted on sheep, and palmitoleic acid appeared to help prevent some of the sheep from gaining weight, but the sheep did not receive it via their food. It was delivered via intravenous injection. The official website has a few comments that are attributed to satisfied customers, but feedback published on manufacturer’s websites is often hand-picked and/or exaggerated, and some manufacturers simply think up a good story and set it on their site. The marketing material says there are no side effects, but the effects of palmitoleic acid have not been sufficiently researched and long-term supplementation may be unwise. We suggest all potential users discuss the matter with their doctor before using Ultra Omega Burn or any other supplement that contains palmitoleic acid. Ultra Omega Burn is a supplement sold on the back of a great deal of hype that cannot be backed by sufficient supportive evidence. Palmitoleic acid might have the potential to protect against type 2 diabetes and help prevent weight gain. It may also have value in other areas, but researchers state further study is needed. Nutra Active claim restricting sales to their own website will helps keep the price of the product low, but it also helps the company limit the opportunities for customer feedback. Many web stores offer a customer feedback option and it would have been very interesting to read what people had to say about Ultra Omega Burn, had the opportunity been available. 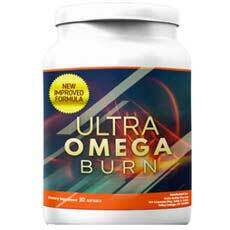 You can only buy Ultra Omega Burn from the official product website. Nutra Active claim they have to sell it directly to customers because this preserves its effectiveness, They then go on to state: “The only products you see in stores or online retailers are very, very cheap products filled with cheap ingredients.” The company also claims the stores would inflate the price to $200 per bottle. The price via the Ultra Omega Burn website is presently $49.99 per bottle, but the company was initially charging twice this amount. 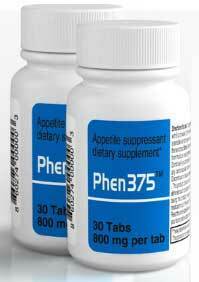 We would suggest looking closely and Phen375 – a dual action fat burner and appetite suppressant. Available without prescription but containing pharmacy grade weight loss ingredients Phen375 is arguably the best of it’s kind on the commercial market and has been since 2009. Phen375’s longevity is a major selling point – bad or ineffective product simply don’t last this long. Phen375 is an “advanced weight loss formula” produced in the USA and Canada and it has succeeded in helping so many people to realise their dreams of weight loss it is one of the best known and most highly regarded diet pills in the world. Over 250,000 former users have provided testimonials saying how well the product works. Customer reviews are important and any diet pill that succeeds in impressing that many people has to be very good indeed. When we read what people were saying about Phen375 and saw how well the product worked we were extremely surprised to discover users only need to take one pill per day. Creating a one-pill-per-day formulation that delivers such good results is an incredible feat, so the “advanced weight loss formula” statement written on the front of the bottle is a lot more than a marketing gimmick. Phen375 is available exclusively from it’s own official website. There are only six ingredients in the Phen375 formulation and they are all natural. However, the ingredients used are also pharmaceutical grade and this will no doubt be one of the main reasons the pills manage to pack such a powerful punch. L-Carnitine: An important amino acid that performs many roles within the body. It’s probably been added here because of its reputation as a hunger suppressant, but research shows L-Carnitine is also good for fighting fatigue so its inclusion should help ensure a life with less calories does not sap the body of vitality and cause feelings of lethargy. Citrus aurantium: A popular diet pill ingredient sourced from a species of citrus fruit. Citrus aurantium is as good at battling diet-related fatigue as it is at fighting the flab, thanks to the presence of a fat burning stimulant called synephrine. Caffeine: Another good inclusion that should prevent feelings of fatigue. Caffeine is also a proven fat burner and, for this reason, is one of the most popular diet pill ingredients in the world. Coleus forskolii root: A good ingredient that is often ignored by diet pill manufacturers, coleus forskolii is known for its fat burning ability and is equally respected as a testosterone booster. Extra testosterone can result in extra pounds lost, so its an ingredient that offers double benefits. Cayenne pepper: Another versatile ingredient, cayenne is a good natural appetite suppressant, but it more highly praised for its proven fat burning abilities. Research shows supplementation with cayenne can provide a 24-hour fat burning effect, so its presence here could explain why a single capsule a day can provide such staggering results. Dendrobium nobile (orchid) extract: An ingredient that aids the digestion. Cayenne is a fiery ingredient so dendrobium nobile has probably been added to prevent stomach upsets. The fact that none have been supported suggests it serves this purpose well. The Phen375 formulation contains ingredients that can help people to eat less food. When less food is consumed the body gets fewer calories and, if the calorie intake is decreased sufficiently the body will start burning its fat. Such a lack of calories can lead to fatigue, so the formulation has been designed to prevent this from happening and help ensure people using the product don’t feel so drained they throw in the towel. Phen375 also contains ingredients that tweak the body’s natural fat burning abilities and help it to become more efficient in this regard. Although Phen375 has no known side effects, it’s not intended for women who are pregnant or nursing a child. People who have existing health conditions or concerns should check with a doctor before using any brand of supplement. The same advice is offered to people who are using medication or planning to combine the use of Phen375 with another product. We would be happy to recommend this product on the strength and quantity of positive customer reviews alone. Phen375 contains a powerful blend of natural ingredients, it gets the job done, and the price is very reasonable for a product of this quality. 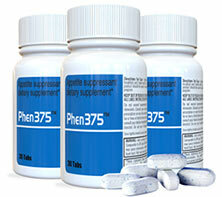 If you are looking for a diet pill that really works, you won’t find a better option than Phen375. Phen375 is exclusive to the official website – it is not available in pharmacies (such as Walmart, Rexall, Lawtons, Shoppers Drug Mart. She Supps Fat Burners is a weight loss supplement produced in the UK for She Supps. All the company’s products are intended for women and are packaged in receptacles that are not made of plastic, in an effort to lower pollution and be kinder to the planet. Diet pills made for women are becoming increasingly popular, but it’s usually just a marketing gimmick. Most products of this nature contain ingredients that are equally suitable for men and Fat Burners is no exception. If you want a truly exceptional fat burner then we recommend Phen375. Phen375 has been on the market for several years and is consistently the market leader. Mercilessly copied, Phen375 is the original Phentermine alternative – it is a dual action fat burner and appetite suppressants. It’s sheer number of success stories underlines and highlights it’s standing within the industry. We like the idea of trying to pack products in an environmentally conscious way, but have issues with some of the claims made for the product and have to wonder if She Supps is still using the original formula because the present list of ingredients does not show any green tea or guarana. It does contain caffeine, though, and it’s a pretty potent dose, so the claim that there will be no caffeine side effects does not hold water. 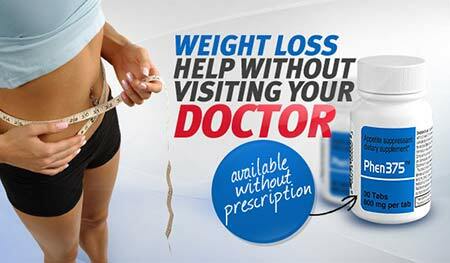 The claim that it contains the most effective weight loss and energy boosting ingredients is only partially true. As an energy provider, caffeine is hard to beat and the formulation also contains a couple of other stimulants, including taurine (used in Red Bull energy drinks). However, none of the ingredients can be classed as being the best when it comes to weight loss. Green tea and capsicum beat them every time and do so without presenting the same risk of side effects. Caffeine Anhydrous (180mg): A fast-acting caffeine powder. Caffeine is probably the most socially acceptable stimulant in the world and its ability to boost concentration and reduce tiredness is one of the reason coffee is such a popular drink. Caffeine is also a proven fat burner, but some people do not tolerate it well. Even those who do may experience caffeine-related side effects, such as jitters and headaches, if the dose provided is higher than they are used to. L-Tyrosine (200mg): An amino acid that is one of the building blocks of protein and is often added to bodybuilding supplements. 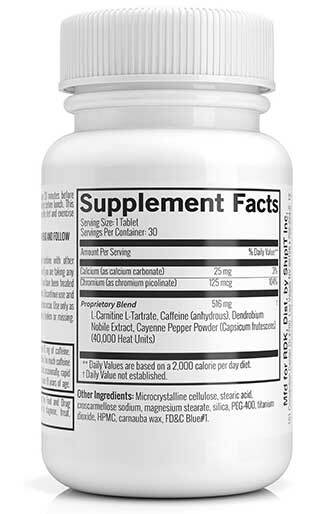 There is evidence to suggest L-Tyrosine has the ability to reduce stress and help prevent fatigue. Its presence here has value, but it also adds another stimulant to the mix. L-Tryptophan (50mg): An amino acid the body uses to manufacture the feel good hormone serotonin. Vitamin D3 (50mg): The body normally gets Vitamin D from sunlight and food. It helps the body absorb calcium, so its very good for the bones. Some studies suggest Vitamin D deficiency may cause weight gain, so it’s presence here is potentially good, but the inclusion rate far exceeds recommended amounts. L-Taurine (25mg): An amino acid that stimulates the mind and body and, if the manufacturers of Red Bull are to be believed, can even help give you wings. Vitamin B6 (1.7mg): A B vitamin that helps ensure a healthy metabolism. It’s also good for the eyes and skin and for providing an energy boost. This has not escaped the attention of the people behind Red Bull. Vitamin B6 is one of several B Vitamins incorporated into their drink. One capsule is required, two times per day. Four to six hours should be left between doses. Due to the high caffeine content, the second dose of the day should not be taken later than 3pm. No customer feedback is available. She Supps Fat Burners contains a lot of stimulants and an unusually high amount of Vitamin D. It should not be used without a doctor’s approval. She Supps Fat Burners is only available from the manufacturer’s website. The tester pack only contains 10 capsules and will allow customers to try the product for two and a half days. The Jar is made of glass, contains 120 capsules, and is good for 60 days of use. The bag is made of biodegradable paper and is intended to be used to top-up the jar. There is no money back guarantee. 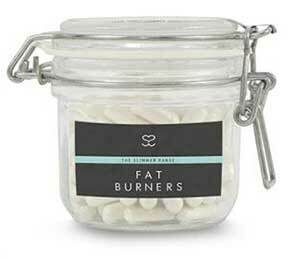 She Supps Fat Burners is a stimulant-driven fat burner. So are many competing products but cramming a pill full of stimulants is not the only way to make a product that can encourage the body to burn fat. It works, but it is always better to use stimulants in moderation and combine their abilities with fat burning compounds that don’t present the same risk of side effects. However, presuming She Supps hasn’t made a mistake when they compiled their list of ingredients, the amount of Vitamin D3 included in this product, presents the most cause for concern. If you are a fan of stimulant-driven fat burners and want to give this one a go, we suggest you refrain from doing so without the approval of your doctor. As recommended above our preference is for Phen375 – a dual action fact burner that virtually sells itself largely due to its loyal and ever growing customer base. 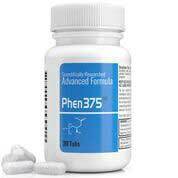 Phen375 can suppress appetite and burn excess body fat, it is available direct from the manufacturers website.